Keeping historic buildings in good repair and, where possible, in use, is the key to their preservation. 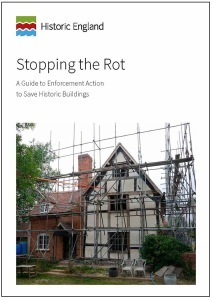 Owners of listed buildings are under no statutory obligation to maintain their property in a good state of repair, although it is in their interests to do so. Local authorities can, however, take action to secure repair when it becomes evident that a building is being allowed to deteriorate. Urgent Works Notices, Repairs Notices and Section 215 Notices can be very effective tools to help secure the preservation of historic buildings. This guidance is designed to help local authorities make effective use of these powers. It provides step-by-step advice on the use of the main procedures and includes case studies and a selection of specimen letters, notices, schedules and agreements. Samples of these are available to download at the bottom of this page for local authorities wishing to edit them for their own use.